Benjamin Nnamdi Azikiwe, P.C. 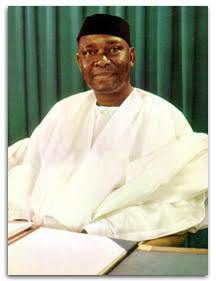 (16 November 1904 – 11 May 1996), usually referred to as Nnamdi Azikiwe or Zik, was one of the leading figures of modern Nigerian nationalism. He served as the second and last Governor-General of Nigeria from 1960 to 1963 and the first President of Nigeria from 1963 to 1966, holding the presidency throughout the Nigerian First Republic. Born in Zungeru, in present-day Niger State, Azikiwe learned to speak Hausa, the main indigenous language of the Northern Region at an early age. He later lived in Onitsha, his parental homeland where he was raised by his aunt and grandmother and learned the Igbo language. A sojourn in Lagos exposed him to the Yoruba language and he was in college, he had been exposed to different Nigerian cultures. Motivated to get a university education, he traveled to U.S. and attended various colleges including Storer College, Columbia University and Howard returning to Africa in 1934 to start work as a journalist in the Gold Coast. In British West Africa, Azikiwe was an important advocate of Nigerian and African nationalism, first as a journalist and later as political leader.